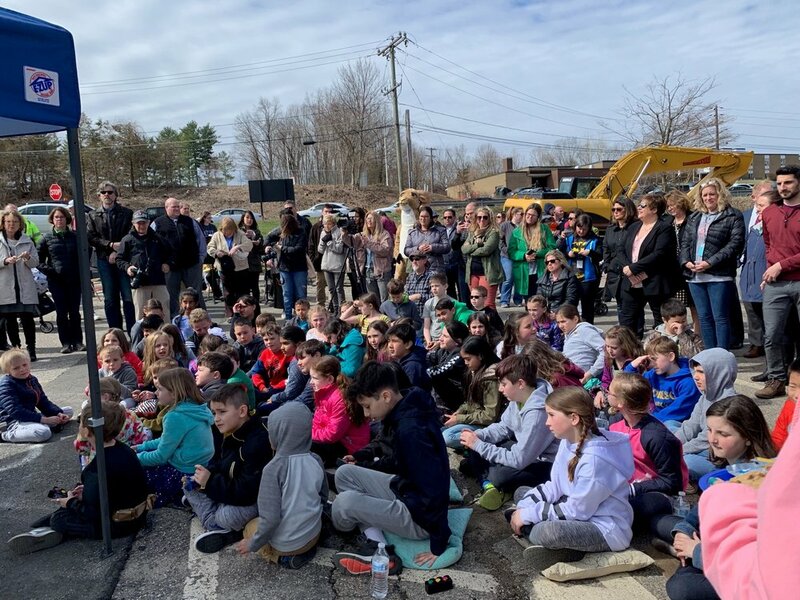 Thursday’s groundbreaking ceremony in recognition of the Anna H. Rockwell & M. T. Johnson Elementary Schools Additions and Renovations projects was, in every sense, a success! The Bethel community joined us along with the Bethel school administrators, building committee, and students, and we had a memorable day on all sides. Thank you to everyone who came out; we are so excited to be working on this project in our own backyard! Stay tuned for more project updates! Bethel Public Schools, the Town Of Bethel - CT, and Rizzo Corporation invite you to attend the groundbreaking ceremony in recognition of the Anna H. Rockwell & M. T. Johnson Elementary Schools Additions and Renovations projects. The ceremony will be held in Johnson's side parking lot and will include photo opportunities as well as addresses by key individuals of the projects. The rain date for this event is April 23rd at 11 am. Please email pares@bethel.k12.ct.us with any questions. Over the past year, the Rizzo Corporation, the Bethel Public Site and Building Commission, State of Connecticut Department of Administration Services, and the design team from Perkins Eastman have been working together to develop a project that satisfies the customers education objectives and falls within the approved budget. The end result of the pre-construction process is the presentation for acceptance of the Rizzo Guaranteed Maximum Price (GMP). Prior to the GMP, Perkins Eastman developed documentation at three stages of design. Each design stage represents a higher level of completeness starting with schematic design (SD), continuing with design development (DD), and ending with construction documents (CD). At each design stage, the Rizzo pre-construction team, lead by Ed Barrett and Ron Cassella, performed constructability reviews, value engineering evaluations, schedule development, and a detailed budget. Recommendations were presented to the commission prior to moving to the next stage. With the issuance of the construction documents and with the approval of the Department of Administrative Services and the Bethel Public Site and Building Commission, the Rizzo Corporation as Construction Manager advertised the projects for subcontractor bids. Each project included over thirty bid packages. Once the bids were received and evaluated, the apparent low bidders were interviewed to make sure all the requirements were met, they fully understood the project schedule, and included all the work scope within their proposal. Once the Rizzo Corporation was satisfied the contractors were properly vetted and confident in their abilities, the GMP was developed and presented to the Building Commission and Bethel Town Officials for approval. Why does any of this matter? Our Guaranteed Maximum Price locks in the project construction costs. Rizzo is responsible for cost overruns, unless the GMP has been increased via a formal change order. Project contingencies are included in the GMP to cover the inevitable unforeseen conditions and the unused funds will be returned to the Town of Bethel. For more information, check out The News-Times' writeup here. Join Our Team as A Project Manager! Rizzo Corporation is seeking a Project Manager in a full time position. This individual will be accountable for overseeing all aspects of assigned projects from commencement to completion. This individual is responsible for managing these projects in a manner that exceeds our customers’ expectations and ensures our work adheres to all company safety policies and OSHA mandated requirements. Oversee pre-con meetings to ensure successful handoff from estimating to field. Collaborate with prefabrication and design departments. Set clear goals and expectations to Subcontractors and Suppliers. Negotiate and resolve any and all customer concerns. When necessary, estimate change orders for assigned projects. Manage all job closeout procedures. Conduct post project reviews to determine areas for future improvement. Provide coaching/counseling to Project Engineer and Superintendent. Develop and maintain a network of professional relationships within the construction industry. Skills/Qualifications: Proficiency in Microsoft Office is required. Accubid and Oracle experience preferred. A working knowledge of Primavera Expedition, P6, PM Web and Prologue is a plus. **Send Resumes to Krystin Sheahan via email at ksheahan@rizzocompanies.com.